Merry Christmas to you from Malawi from our Family to you and yours. As this year draws to a close, we are continually thankful to be blessed with such amazing friends. To be in your hearts, thoughts, and prayers is a blessing that can never be measured; yet we see the results here everyday. Here are some recent stories from people in our church and Bible school that really encouraged us. The first example is from our own family. Today as we sat for prayer with Julie and Pr. Albert I could hear our children playing in their room in the background. They were singing worship and praise songs. That brought a smile to my face and later I asked them what game they were playing. They responded, “church”. I came to find that they had built a stage with Legos and were making their Barbies lead the Worship service. What a great encouragement to see God make His way into their little lives. I can imagine Jesus right there in their midst smiling with them as they glorify God with their joy. I think again of a visit we made to one of our church members home’s a few weeks ago. This is a member that has been with us from before the beginning. He came to Bible studies that we did here when we first visited 3 years ago. Upon moving here and visiting his home for the first time, we found he was living with another woman without being married. The visit was awkward and we could feel tension as we sat in his home. Later we found that his girlfriend was skeptical of us as foreigners and I’m sure under conviction. Within a month or two without any direct exhortation from us, this man broke off the relationship citing that he didn’t feel that his girlfriend wanted God. Another 6 months passed and he mentioned that he was moving back in with his girlfriend. We said to him why not marry her and we as a church could do the wedding. What a transformation came as a result. His fiancé started coming to church, her skepticism was washed away as she drank in the love from the church and the Word of God. Over the past weeks as we planned the wedding, her face glowed with a smile that was opposite of the way we first met her. Yesterday, we did their wedding during the Sunday morning service. It became an evangelistic event since some of her family members are Muslims. It was awesome, we had ladies with Burkas in the church; and we just poured on the Love of God and presented the clear Gospel. Our church members coming to take pictures with the new couple! Lukia witth her daughter, Sarah and Joseph! The last example was also another wedding (Rededication actually) we did on Saturday – It is the month for weddings apparently. This ceremony was for one of our church members who previously lived in England. He and his wife have been married for 7 years but living apart for a few years due to visa problems. His wife came to visit for the Christmas holidays and he asked if we could do a rededication of their wedding vows. We had a great time of fellowship in the days leading up to the ceremony. His wife was really searching for God, and said that she feels God ministers to her especially when she visits Africa. We just encouraged her in God’s plan for her and the providence of God putting us all together. Their ceremony was this past Saturday; it was a simple and beautiful one. After the ceremony we were invited to the reception at the family’s home. I was in awe to see the great reverence of the Word of God. To open the reception, I was asked to share about the importance of the family. Every person in the reception, 60 people, gathered in the Living room of the home and we shared the Word of God, it was a full weekend. May God bless you this Christmas and New Years Holiday! Jude 1:22 – Some have compassion making a difference. I asked myself a question the other day…what is the quality that I love the most about Christ. The one that stood out is His compassion. I thought about when He touched the leprous man in Luke 8, or when He looked and loved the rich, young ruler. He identified with each person He saw and had a ministry of compassion to them, even if it was a hard saying. By the Grace of God, that is the spirit we would like to have here in Malawi with every person that comes through the threshold of our personal space. After spending a few hours in Malawi you can’t help but have compassion on people with the hardships they endure on an everyday basis without losing their joy. Most Malawian homes have 1-2 rooms. There is the small living room where most everything happens and the bedroom for the parents. The children sleep in the living room on the couches or reed mats, while the parents have their room. Most Malawian homes don’t have electricity or running water, so the cooking is done outside on a small grill with charcoal. That also limits the amount of food they can keep, so people mostly buy their food for the day (no electricity=no fridge). Most people must fetch their water to a nearby well. The staple food, nsima (a ball of ground, cooked corn; much like grits), is eaten for lunch and dinner everyday with a meat stew or a vegetable on the side. The truly baffling thing is that families will sacrifice the little they have in order to entertain a guest. As many times as we ask people not to prepare us a meal if we visit them, we find it their joy to provide a meal even in their want. Most jobs that people have are not formal, they are mainly self-employed by buying and selling things. 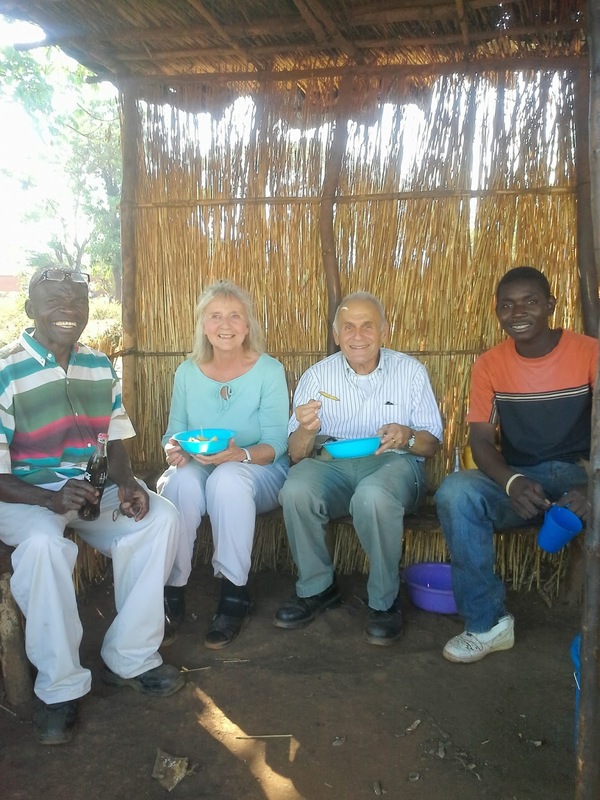 The one good thing about a Malawian home is that most everyone has a little plot or space to grow crops like Maize (White Corn), spinach…they are very hard working people. We can see every morning women with their babies on their back tilling the land to get it ready for rainy season. So we make plans, wait for people that do not know “british time” and 1 hour or so later, we go with them to their home! As we are here with our family, we try to do a visit altogether with the girls at least once a week, with our car or taking the local transport (mini-buses)! The girls love it, they are very social and after 5 minutes into a visit at someone’s house they are outside playing and have become the “compound kids” as ALL the kids from the surroundings will come and will want to play with them. We just had my parents visit us for a month. Being their first time in Africa, they were not sure what to expect. It was amazing to see them jumping right in to our everyday life and adapting. The church and Bible College was deeply blessed to have them and they were a great example. They would see my parents coming every time to evangelism and caring for people as they would be on the street and it was encouraging to them. 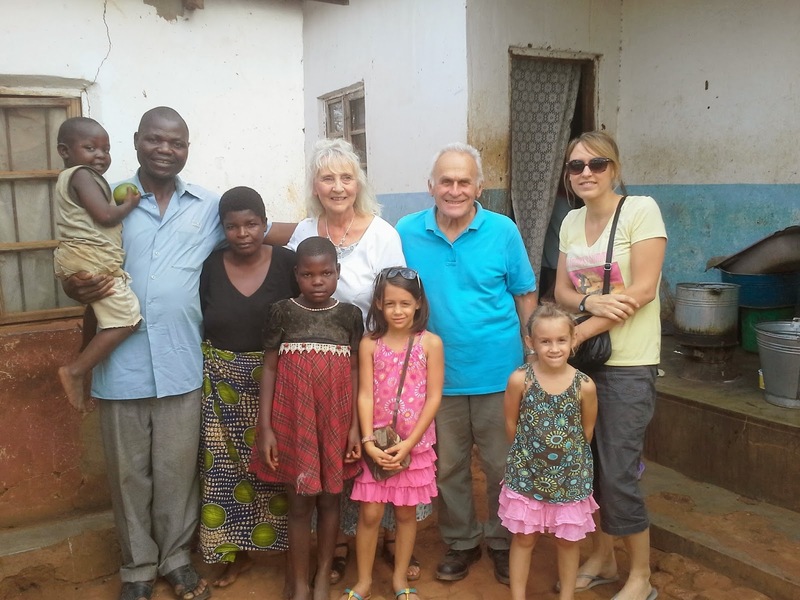 People in Malawi are very respectful of their elders, so to have my parents here, was a great honor to the church. They came with us to visit church members at their homes, ate local food and sat where people sat. Pr Johan from the G.G.Church of Pretoria, South Africa visited us! Saturday Outreach with Bible College Students! Dinner at our house with Peter and his family - members of our church.